You're a mean one mister Grinch! But you are also pretty tasty. Especially when you are in a spinach tortilla sandwich with turkey! 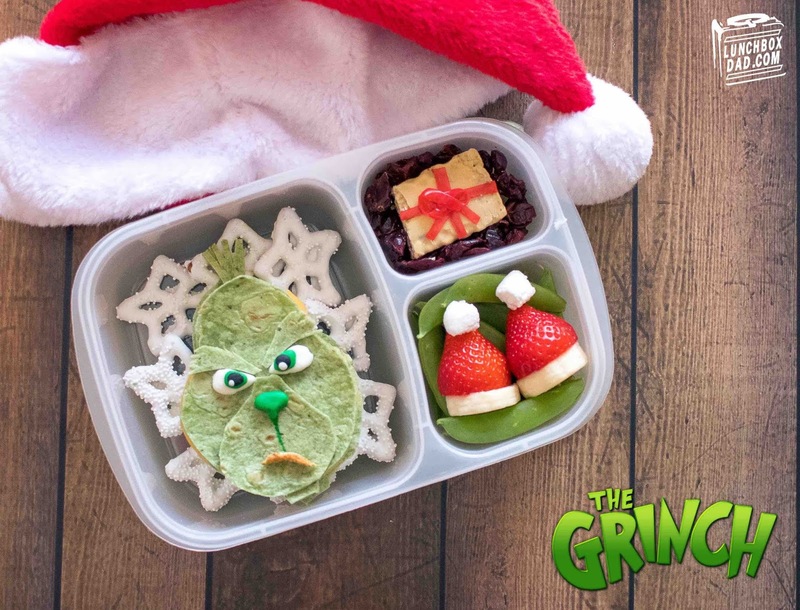 The Grinch is such a legend n Christmas lore and we are so excited to see the new movie. My family is obviously huge fans of How the Grinch Stole Christmas that I had to make a new lunch to celebrate the new movie coming out. 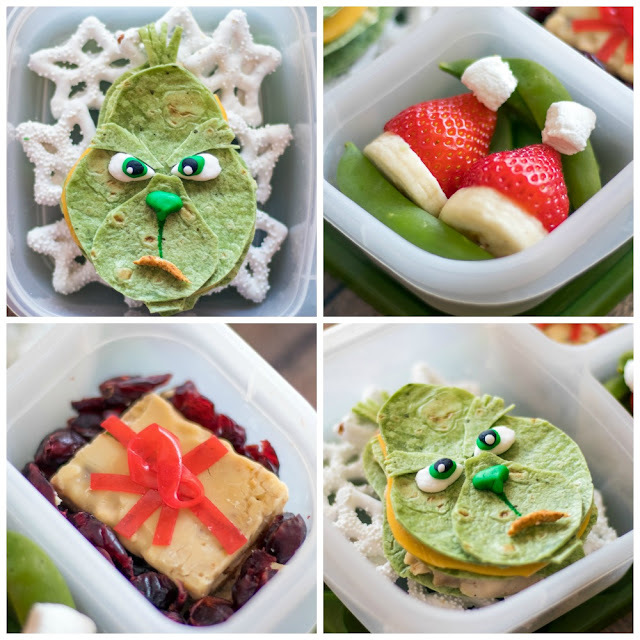 The Grinch is actually one of the first lunches that I made during my first year of trying this fun lunch making thing out. I actually created the lunch live on a morning television show with my daughter. That time I used a green apple but I wanted to go a different route this time. I'm pretty happy with how it turned out and I hope my kids will be as well. Keep reading to find out all of the ingredients and directions! 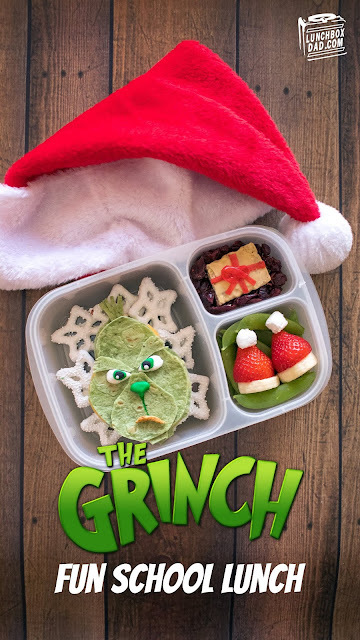 Ingredients: Spinach wrap tortillas, sliced cheese, turkey, yogurt covered star shaped pretzels, snap peas, banana, strawberries, marshmallow or yogurt covered raisins, granola bar, dried cranberries, fruit roll up, black, green, and white fondant, green food coloring, whole wheat bread scrap. 1. Cut the Grinch's head out of tortilla. Repeat two more times. Layer cheese and turkey between the head pieces. Use tortilla scraps to cut out the eyebrows, front of face, and hair. Place where shown in photo. 2. Draw a line with green food coloring down front of face. Use a very small amount of fondant for the eyes and nose. Make a mouth out of bread scrap. Place facial features where shown in photo. 3. In main compartment of lunchbox, place star pretzels. Put grinch head on top. 4. In first side compartment, put two pieces of granola bar. Create the ribbon with a tiny piece of fruit roll up. Surround with dried cranberries. 5. In second side compartment make my Strawberry Banana Santa hats and surround with snap peas. The directions for the Santa Hats are HERE.